On a night when Oregon never seemed to get a rhythm going, they dug down deep and found a way to hold off stubborn Arizona State last night at Matthew Knight Arena, 68-65. The Ducks won primarily by hitting 7 of 8 free throws in the final 58 seconds. With the win, the Ducks improved to a 14-2 overall record, and are 3-0 in the Pac-12. Three nights after upsetting unbeaten Arizona in perhaps Oregon’s finest effort of the season, the Ducks came out flat and uninspired against ASU. The Sun Devils entered the contest with a 14-2 record, 3-0 in conference, and managed to wrest the tempo away from the Ducks by playing a physical, contest-every-drive, contest-every-shot, type of defense. Despite the physical play and the determined ASU effort, the Ducks won because they managed to out-rebound the Devils (by eight boards in the final 10 minutes), and they excelled at the free throw line. Four Duck seniors hit free throws in the final minute of play to keep the game out of reach for ASU. Altman said, “There weren’t very many free throws shot until they put us at the line late. Arsalan hit a pair. Tony hit a pair. Carlos hit a pair, and E.J. hit one of two. I was pleased with how our free throw shooters stepped up on a night when we weren’t very sharp.” Oregon was 14 of 15 for the game from the charity stripe. The Ducks went on a 7-2 run in the final three minutes of the first half to take a four-point lead into halftime, 32-28. Neither team shot the ball well early and a very deliberate ASU team took the most they could of the shot clock on many of their possessions. For the Ducks, Carlos Emory continued to produce at a high level. He scored 14 points on 5 of 7 from the field and pulled down eight rebounds. Stepping to the free throw line for the first time all night with 13 seconds left, he drained both shots to put the Ducks up by five. 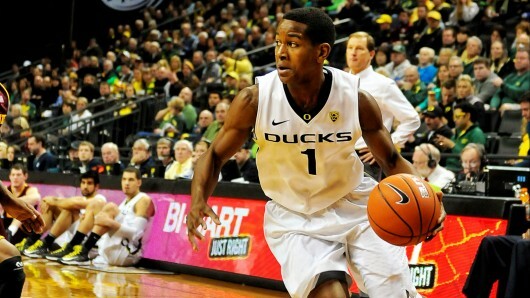 The Ducks once again had four players in double figures, and three with 14 points. In addition to Emory, Tony Woods and Damyean Dotson also had 14. Dominic Artis scored 10 points and contributed three assists and two steals. For ASU, they didn’t go quietly. There were 12 lead changes in the contest. A three pointer by Carrick Felix with 2:09 left gave the Sun Devils their last lead at 60-59. On their next possession, the Ducks recaptured the lead for good when Woods put down an emphatic dunk with 1:44 left. The Ducks successful parade to the free throw line began shortly after. ASU Freshman Jahii Carson led all scorers with 20 points, including several threes late that kept ASU in the game, and Evan Gordon added 17. The Ducks continue to make progress. 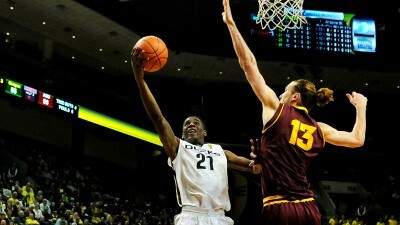 The upset over Arizona wouldn’t have felt nearly as good had the Ducks slipped up against the Sun Devils. With three conference wins and no losses, the Ducks are tied with Washington in second place; just one-half game behind UCLA, which is alone in first with a 4-0 mark. Oregon plays USC Thursday in Los Angeles. Taking it on the road against an undefeated league foe in UCLA on Saturday is the next step with a game for first place in the Pac-12 Conference on the line.